This 700 Calories a day diet plan is safe to use as an every other day option or a few days a week. It is not advised for a full seven days in a row without first consulting your physician. Knowing and paying attention to your hunger signals is very important when trying this 700 calorie diet menu plan for weight loss. Please add more low-calorie veggies, if needed. To have proper energy levels, you may need a few more calories than listed in the plan. There are times that people want to lose weight quickly and will reduce their calories in an unhealthy way. This diet plan is full of healthy and filling foods, to help you meet your weight loss goals. Download the 700 calories a day diet plan, including a grocery list and portion sizes for a full 7 days. Or do this plan every-other-day for the next 14 days, the shopping list will last you 2 weeks. This is great if you know you will be eating out with friends or family several times a week and still want to lose weight. If you are concerned about your ability to stay healthy on this type of plan, consult your doctor or see our Daily Calorie Needs Calculator . 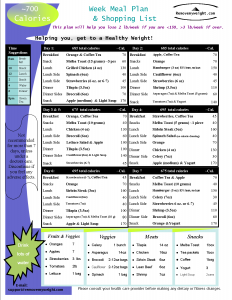 Please refer to the suggested daily diet chart to choose the best diet menu plan for you. Although 700 calories a day is not enough to give you much energy to exercise. Exercise is always recommended if you are committed to losing weight for the long term. This 700 calorie diet menu plan is full of highly nutritious foods that will give you your needed protein without the fat. Also, it is full of fiber-rich foods that will keep you full. Most of the foods have a high water content which helps keep you full and hydrated. 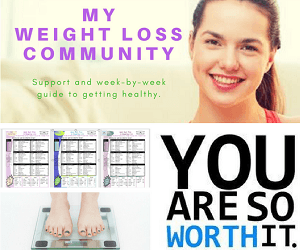 If you are considering this plan please also review our 1000 calories per day plans and our 1200 calories per day plans, which will provide you with more energy to allow for exercise, and will be something you can do daily without feeling like you might not be able to complete the week.